possibly the one involved here. The priest Lucas Branković deposed: He was on the captain's galley. It was true that the captain stopped several times for bad weather, and that he had to return to Durazzo three times for the same reason. They also had to stop and wait several times for the galeota to catch up with the galleys. The captain was neither arrogant nor bad-tempered, as the Serbs complained, but on the contrary, he was most respectful of them. Lucas heard it said that the galeota had taken two cattle from Arniti territory. The captain had not bought linen: he didn't know if the patrons did. Several people had bought skins, but they put them on the galeota and not on the galleys. Juniti Grdečević, comitus of the galley, deposed: The delay was because of the galeota which could not keep up with them. The Serbian lords insisted on speed, which the captain explained was impossible. It was not true that the galleys were delayed in two ports because of the falcons and the dogs. The fiancée had made gifts of wine to the officers. The galley and galeota patrons came aboard the captain's ship every evening to take council. His junior officer confirmed his statement. Ser Alvise de Restić, patron of one of the galleys, deposed: The sailing was reasonable, except when they left Clarenza and the fiancée wanted to stop at Corfú for lunch. The weather was not good. It was decided to leave at midnight but when Restić called for them to go, no one responded and they left at dawn. The galleys went to Sta. Maria de Caroppo but the galeota stayed at Corfú. That was because of the dogs that had been stolen from the captain. The galleys waited for it at Sta. Maria. The Serbian lords complained of the captain's attitude toward them but Restić never heard anything amiss. Several people bought linen and skins, which they put on the galeota, not on the galleys. He knew nothing about the fiancée's gift of wine. He had heard that the captain had taken cattle aboard. Restić continued: At Cape Lachio they wanted to get water, but the Albanians came to the shore armed with swords and arrows, and kept them off. The captain used the bombardella, which was useless. So they stopped at Kefalonia for water on the way to Clarenza. He heard from the patron of the galeota, the people on the ship, and the slaves, that the captain had seized a goat, and the patron of the galeota a cow. At Clarenza, the captain told Restić that they were instructed to make three visits to the Despot Thomas: the first, on their arrival; the second if they were invited to dine; the third at their departure. The first visit Restić went with the captain. The second and third visits, the two galley captains and the patron of the galeota went. He heard it said at Clarenza that the sailors had drunk 10 caratelli of wine which were on the quai, and wanted to take one on the galeota, but the Port Authority stopped them. In the waters off Kefalonia, they encountered a small ship that complained that the sailors on the galeota had thrown a stone at them and wounded a Greek. Patron: one of the investors in a trading voyage. Galeota: a small, light galley. Comitus: a patrician assigned to command a galley, although there was a real captain on hand. Caratelli: small barrels made from chestnut. The story comes from Dubrovnik in the 14th and 15th Centuries, by Bariša Krekić, #1119. This is why I never want to do jury service. Where is Arniti territory? Could it mean Arianiti? Probably. That's the way it's spelled. In reply to some of your questions concerning Helena, yes she would have spoken Italian very well. Her grandmother was Creusa Tocco. The Tocco family were an Italian family by origin. 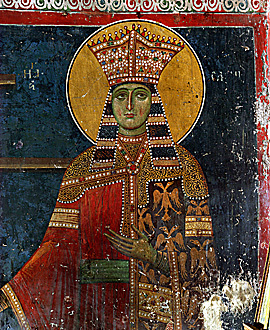 Helena would have worn both ornate Greek dresses and highly fashionable Italian dresses. The ladies that she was to entertain in Ragusa she would have done with complete ease. Her fathers side of the family are related by blood to her husbands family. The Brankovic dynasty and Palaiologos dynasty are one and the same.